I’ve been living at the Epic Self Headquarters for 3 days now, and it’s been quite an adventure learning how to turn these amazing piles of organic produce into meals. Previously, my only real experience with raw food preparation was chopping everything up and making a salad (which is also AMAZING) – but after about 4 salads so far, I was craving something creamy, rich and super flavorful. It’s interesting to notice the little leap of courage it takes for me to jump away from any recipes or set amounts of ingredients, and just play around to create new things in the kitchen! It represents letting go of the need for perfection, flowing with the moment, and being open to new delightful creations in your life! Here is the recipe I came up with. So easy! I served this as a light meal with tomato slices, but it would be excellent mixed into a pasta, spread on crackers, or anywhere else you desire! 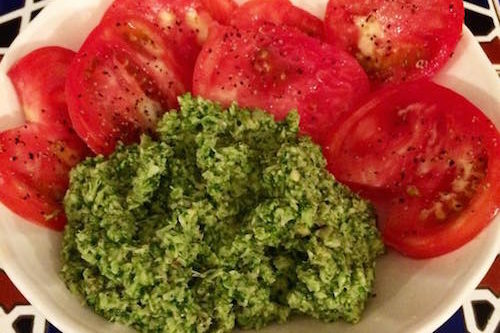 Put everything into a food processor, and process until it reaches the consistency of pesto!